Personalized printed sunglasses classic – orange simply rocks during summers! This orange summer eyewear can be teamed with most clothes and they look funky on everyone. It can be worn during summer safaris to parties or during the tour of city or while stepping out in sun to buy something. It easily rubs a feeling of coolness in minds of people who see it closely or from a distance. Fashion houses, streak individuals, luxury lifestyle stores, and food businesses are all seeking these sunglasses for value gifting during summer events, etc. We offer value pricing on bulk orders and marketers working in small budgets can avail this benefit to the maximum. 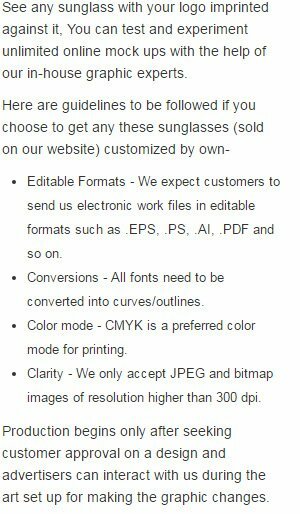 Request for a quote to know more about value savings that can be availed on personalized printed sunglasses classic – orange.